I like how this fan uses only 7.5 amps so if you like you ca ..
"It dries fast. I used it on high in shag carpet which would normally take a whole day to dry and it only took 20 minutes. To be honest I wish I had a whole stack of them instead of just one. I have told many people about this unit, they work great." "I don’t leave for a job without it. It is my co-pilot; I seat belt it into the truck next to me." Receive half price shipping by picking up at SteamBrite SATX. This article is meant for sharing with your restoration customers! This week, we get Jim Hassi's insights on what distinguishes the AirPath airmover for drying floors. "The AirPath is unique - it's a patented product with truly no peer on the market. None. With theAirPath, it's not just how fast it dries or how much it dries. It's the value proposition - how it shortens work time so the area can be reoccupied sooner. "It pulls warmer air from above and drives it down and out through the patented grill at up to 40 mph - up to 12 feet in all directions. You can't get the same 360° drying pattern from anything else. Thermal images of the AirPath's rapid 360° drying at work: yellow = warm = dry. "I've had customers tell me that they have almost an emotional connection with their AirPath because they've used it so much over the years. One customer doesn't leave for a job without it. He belts it into the truck next to him when he drives. That's how much he depends on it." "Some customers mention that it seems kind of big, but once they use it, they're sold. They know that they can get an area finished and back in use faster and move on to the next job. We had a customer tell us he used it on shag carpet, which would normally take a whole day to dry, and it only took 20 minutes! That ensures a more satisfied homeowner and no need for the carpet cleaner to return to the job. "Most cleaners say the AirPath dries one room while they're cleaning the next, so the entire house is dry by the time they pack up the truck. That means a big increase in carpet cleaning productivity. For a lot of cleaners, that's huge." "The AirPath is great for large areas but most jobs also require an airmover for small spaces such as closets or a stairway landing. The Dri-Pod, the AirPath's little brother, is perfect for this work. You don't want to leave carpets damp, especially in enclosed places like closets. Everything has to be packed out of a closet to clean the carpet. You can't put things back and finish the job until the carpet is dry. So for tight spaces, using a Dri-Pod is critical. Again, you save money and time by using theAirPath and Dri-Pod together to properly dry all spaces." 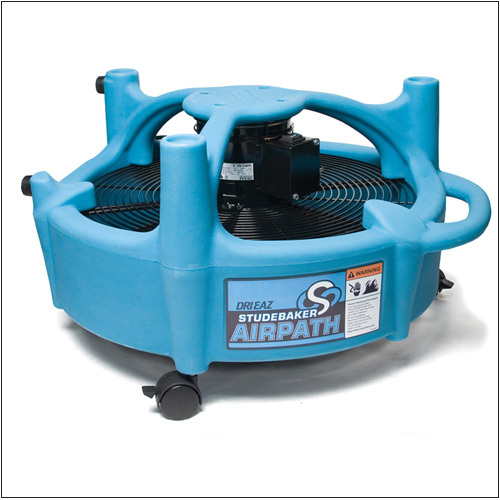 "The AirPath works well for both residential and commercial jobs. Everybody's got regular carpet dryers but this is an omni-directional airmover with a tremendous amount of velocity. This is a huge advantage for drying, especially in large spaces. For anyone doing commercial cleaning or restoration as part of their business, fast drying is essential. If you've got a wet hotel room floor, you can't book that room until it's dry. With a lot of commercial jobs, it's all about getting the area back in use or ready for a layer of wax or other finish. This is the value proposition for drying jobs: get the space back in service." "I have 10 AirPaths total. I can quick dry a room in 10 minutes and move on. I use them for a commercial customer application where I let them run overnight to expedite the drying process so the building can open for business in the morning. I wouldn't want my competition to buy them and take away my competitive advantage." "I carry it in the carpet cleaning van all the time. I can dry a 12 ×12 ft. bedroom and take it behind me so it dries as fast as I can clean and spray. It only has to run the time that it takes me to spray and get the carpet 90% dry right then. Works great for that. We're super happy with it." "The AirPath works really good - nice and strong. We were cleaning some booths in a restaurant recently where drying is an issue. We didn't have much time before the restaurant opened. We cleaned the booths, tilted our Airpaths sideways and got the carpets dry in a few hours before the restaurant opened. The owner was really pleased. The AirPath is a little on the heavier side but it really dries nice." "I have one word to say about the AirPath: awesome! It's great. I use it on every job - a real class act. I know I can always count on it to pull moisture out. When we show up in our nice shiny rig and bring out our nice shiny equipment, customers notice that. The AirPath is part of that professional appearance. I use it in a great room or a bedroom to cover the surface area. All in all, it's a great product." 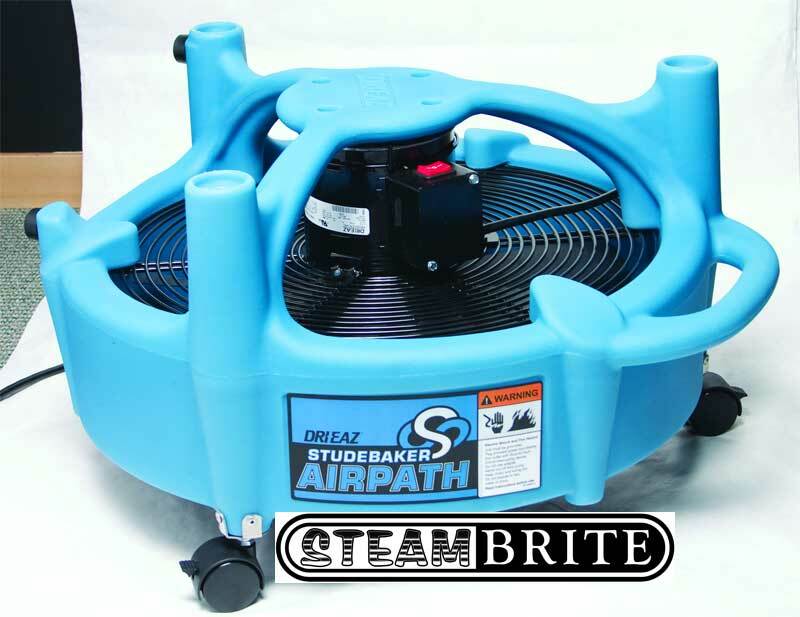 Steambrite will ship the Drieaz F377 Air Path Studebaker Carpet Flood Restoration Air Mover Downdraft [F377] by either Fedex, UPS, USPS, or Freight Quote,, and will normally be shipped within 2-5 business days. Equipment small enough to be sent by ground should typically arrive within 3-5 business days after shipment. Large Equipment could take in excess of 6-8 working days to arrive after shipment, and ground shipping times are not guaranteed. This product was added to our store on Friday 16 November, 2007.